Bring engaging and important ocean learning to your classroom. 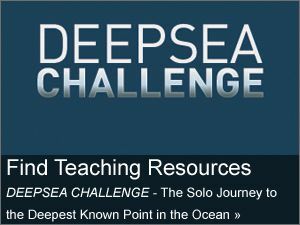 Use these resources to help your students learn about ocean life, human interactions with the ocean, and the ocean’s physical geography, and to gain the information necessary to formulate their own opinions on ocean-related environmental issues. Go to our marine ecology unit to find project-based learning resources you can use to teach students about marine ecology, human impacts on the ocean, and ocean conservation. Build your ocean in this fun game! Players learn about the world ocean, marine organisms, and predator-prey relationships. Use these illustrations with students in Grades 3-5 to explore various marine ecosystems. 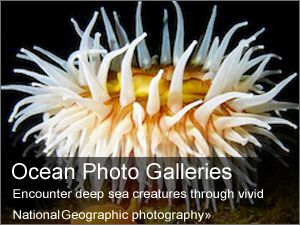 Use these illustrations with students in Grades 9-12 to explore various marine ecosystems. Did you know that 98% of the ocean remains unexplored? Dive into unknown depths with this GeoStory. Be at the forefront of exploration and travel around the globe alongside history's favorite explorers with this GeoStory. Find Out, Wear Blue, and Tell Two! Download this free, reader-friendly guide for teaching about the critical environmental topic of the ocean. Raise public awareness about ocean conservation in your community by hosting a workshop. Want to inspire your students to save the ocean? Here's how! Check out this helpful guide, developed by our friends at Blue Frontier. Find out what National Geographic offers to support ocean conservation. Dive into ocean issues with this blog from National Geographic's Ocean Initiative. See how students from around the world connect to the ocean through photography.